Wouldn’t it be wonderful if grief was predictable! If we knew what we would experience, when we would experience grief, and just how long it would last. Some of our earliest views on grief looked at grief as an illness. As with many illnesses, there was a notion that grief simply had to run its course. Counseling, much like medicine, might alleviate the symptoms – even shorten the experience. In this way, given sufficient time and unless there are complications, we eventually would be fine. More recently, this notion of grief as a universal and predicable experience is a reason for the popularity of “stage theories” of grief. According to these theories grieving individuals face a series of predictable stages much like they would in any illness. Here the stages are psychological. The individual experiences denial, anger, bargaining, and depression before finally achieving acceptance. Based on the work of Elisabeth Kübler-Ross[i], this notion of grief has proved to be markedly resilient, even though research has never supported the idea of stages[ii]. In fact, Kübler-Ross was studying the ways people cope with their own illnesses and dying rather than the process of grief. The theory’s continued popularity with the public may be the result of a number of factors. First, it is widely quoted both by journalists and in media as diverse as news shows or even situation comedies such as The Simpsons and Frasier. Second, it is a simple – even simplistic – approach that promises resolution. In fact, it adheres to the old hero narrative in which a protagonist faces a challenge and, after various trials, emerges stronger and wiser. We may still emerge from loss by growing, but the journey we take can be just as unpredictable as the loss that brought about our grief. Yet as we really explore the idea, the flaws become obvious. We are individuals each with distinct beliefs. We come from different cultures. We live our own individual lives. We have our own relationships with those we love – our own histories. Every loss we experience is unique. The death of a parent is unlike that of a child or spouse – not necessarily easier or harder – just different. Each death occurs in a distinctive way. Some follow a long lingering illness while others are sudden and traumatic. It is impossible to think that given all these differences, we would all respond to grief in the same way. It is little wonder that research has failed to support the notion that grief is a set of predictable stages[iii]. The experience of grief is as unique as we are. While we can recognize different patterns, each of us responds to a different loss in our own unique way. The danger of the stage idea is threefold. First, as we said earlier, such an idea of stages offers an inaccurate roadmap. It suggests expectations of what grief is supposed to be like. When these expectations are unfulfilled, we are confused and begin to doubt our own experience of grief! 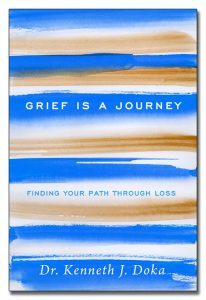 Second, we begin to think of grief as some process – a tidal wave – that takes us along without us having any control. Grief just happens. Often as I lecture, I am asked questions such as: “How long will she be in the depression stage?” “How long will he remain angry?” The reality is much more complex. We would need to explore the individual’s history of depression or of anger. Is that reaction a consistent response to varied crises or life situations? It often may be. Moreover, the idea of stages seems to imply that we can do little but respond to that feeling until it somehow magically passes. Depression remains untreated. Anger is unresolved. Third, as we will explore in later chapters, grief can affect every part of our being – physically and emotionally, as well as spiritually, socially, and cognitively. We can feel ill, experiencing aches and pains. In fact the stress of a significant loss can actually threaten our very health. We may experience all sorts of emotions – guilt, relief, sadness, even at times a sense of liberation. Jim felt that sense of liberation among other feelings when his father died. Even though Jim was in his forties, married, and independent, he still struggled with his father’s obsessive expectations and issues of control. Rarely do we experience one dominant emotion at a time. We are a hive of affect. Grief also can influence our thinking and challenge our beliefs. We may find it hard to concentrate. Thoughts about the person who died and images of the death may constantly intrude. We may feel alienated from our beliefs. To think that our possible reactions to loss can only be one of five pre-established responses disenfranchises the reactions we may be having, thus creating confusion. It would be so easy if grief followed such a predictable set of stages. We would like that certainty and the promise that one day we may accept what now seems so wrong, so unacceptable. Yet, as often, reality is more complicated because we, as human beings in relationships, are complex. [i] Kübler-Ross, E. (1969). On death and dying. New York, NY: Macmillan. [ii] See Doka, K. & Tucci, A. (eds.). (2011). Beyond Kübler-Ross: New perspectives on death, dying, and grief. Washington, DC: The Hospice Foundation of America. [iii] See Doka, K. & Tucci, A. (eds.). (2011). Beyond Kübler-Ross: New perspectives on death, dying, and grief. Washington, DC: The Hospice Foundation of America.